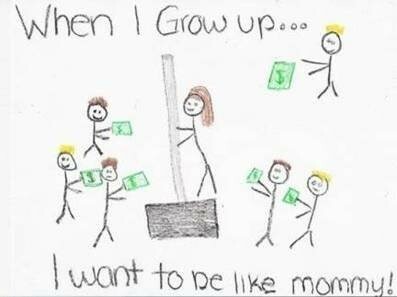 A first grade girl handed in the drawing above for a homework assignment. I want to be very clear on my child’s illustration. It is NOT of me on a dance pole on a stage in a strip joint. I work at Home Depot and had commented to my daughter how much money we made in the recent snowstorm. This picture is of me selling a shovel. This entry was posted in Uncategorized and tagged snow, snow shovel. Bookmark the permalink.